HTC has introduced a new smartphone, removing the “One M” brand name that has been used for some time. The HTC 10 follows on from the HTC One M9 and features a 12 million “UltraPixel” rear camera which has an f/1.8 26mm fixed length lens. The front facing camera is 5 million pixels, but are standard pixels rather than “UltraPixels”. Optical image stabilisation is available for both of the cameras, which should have a positive impact on low light shooting. You can record 4K video with the HTC 10, along with standard video recording at full HD, and slow motion at 720p. The camera has a variety of different modes, including fully automatic as well as a “pro” mode which allows you to adjust certain settings. You can also shoot in raw format. Other specifications include a 5.2-inch Gorilla Glass screen, Micro SD card compatibility, a suggested 2-day battery life and a Qualcomm Snapdragon 820 Processor. HTC uses the Android operating system, and in this case the HTC 10 uses Android 6, or Marshmallow. 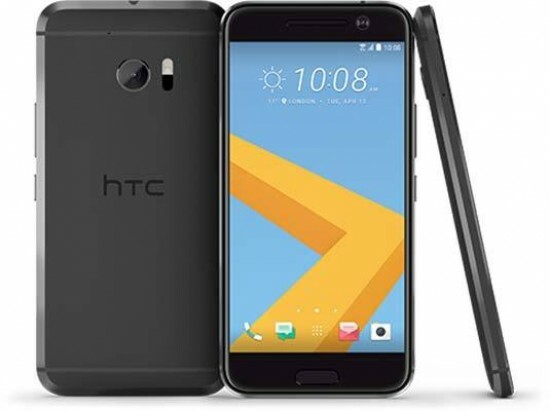 If you are used to using an Android phone then you should find it a very easy transition to make to the HTC 10, especially of course if you’ve been using something like the One M8 or One M9. The design of the phone itself is reasonably minimal, as we’re used to seeing from most phones on the market at the moment. There are three raised buttons, all found on the right hand side of the camera. One of the is the on/off button, and you can also use it to lock and unlock the screen once the phone is switched on. 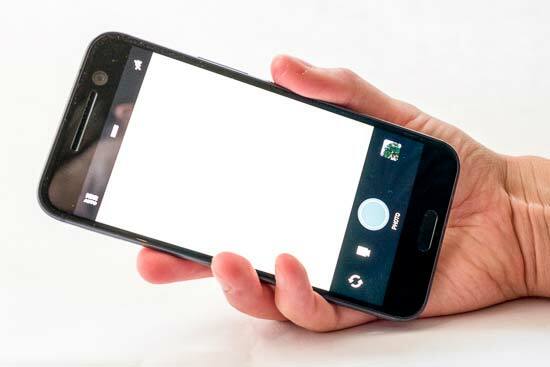 The other two buttons act as a volume rocker, but when you first use the phone and open up the camera app, you will be prompted to set the volume down button to release the camera’s shutter. On the front of the phone at the bottom there is a fingerprint sensor that you can press with your thumb to reach the home screen, but it is not raised like the other buttons. 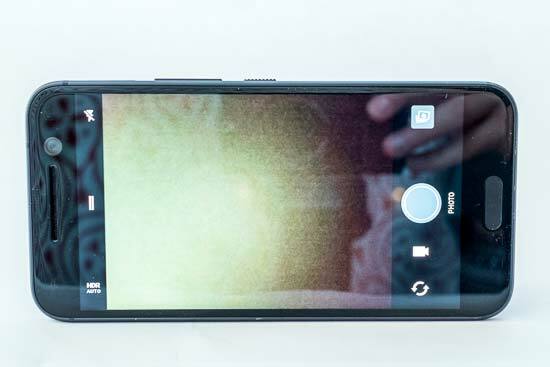 Because the down volume button is in the middle of the right hand edge of the phone, it’s not particularly easy to hold the phone as you might do a standard compact camera when composing your images - instead you have to awkwardly reach over to press down the button. For this reason, you may find that you prefer to use the on-screen “virtual” buttons. From the phone’s lock screen, you can swipe up from the bottom corner to open the native camera app. If you want to look at images you’ve taken in a previous shooting session you’ll need to unlock the phone first. You can use a variety of ways to lock and unlock the phone, including the fingerprint scanner or drawing a pattern on the phone’s screen. The default camera app has quite a simple interface. It will open up in whatever you left it in, so if you were recording a video last time you used it, that’s what it will open in. At the bottom / right (depending on which orientation you’re holding the phone) of the screen you’ll see a large virtual shutter release button, an icon which allows you to switch between stills and video shooting and a preview of the last image / video you shot with the phone. You will also see a symbol that you can press to switch to using the front camera. At the top / left of the screen there’s menu you can drag down to switch between the different camera modes, as well as access the camera settings. There’s quite a few different options here. 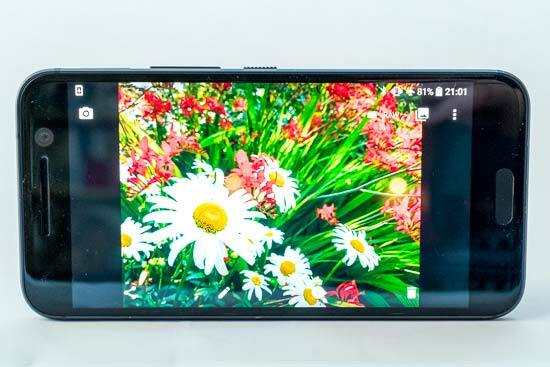 You’ll find “Photo” which is the standard automatic photo option, Zoe Camera, which takes a couple of seconds of video along with each photo to create a “living image”, Panorama mode, Pro mode, Video, Hyperlapse, Slow Motion, Selfie Photo and Selfie Video. Some of the modes have additional options that will appear below the menu if you select it - for example if you select Pro mode, you’ll see that you now have the option to switch on/off raw format (DNG) shooting, the timer or the aspect ratio (4:3, 16:9 or 1:1). If you tap the settings options, then you’ll have a few choices here, including a Grid, the option to Geo-tag photos,a shutter sound, storage options, how the volume button works and so on. It’s likely you won’t need to venture into these settings all too often. Moving on to look at how the “Pro” mode operates, as this is something that enthusiast photographers may appreciate. Once you have selected this mode, you’ll see that there’s now a row of camera settings displayed along the bottom / left of the screen. You have the option to alter white balance, exposure compensation, ISO (sensitivity), shutter speed and focus. There’s no way to adjust the aperture of the camera’s lens. To make adjustments, you simply tap the option you want to change and use the slider which appears. Each of the options also has an automatic option, so for example you could alter white balance, ISO and metering, but you could leave shutter speed and focus on automatic if you wanted to. In order to change the autofocus point, you simply tap the area on the screen that you want to focus on. If you’re shooting in the fully automatic mode, you’ll see that you can adjust exposure compensation by moving a slider up and down next to the autofocus point. The phone can shoot 4K video, and it’s easy to switch that on and off. If you select Video from the top pull down menu, the option to switch between different recording formats will appear and you can simply tap to move between 4K, full HD, and other resolutions (such as something which is suitable for sending in a message). When shooting in 4K, you also have the option to switch on and off high res audio. Thanks to the ability to be able to access the camera’s native camera app directly from the lock screen, you can go from the screen off to being ready to take a shot in under a second. The camera is great at focusing in good lighting conditions, but it does slow a little when the light is low, hunting a little for focus in dimly lit conditions. It’s worth watching for the camera taking a shot when not in focus as that can sometimes happen, especially in lower light conditions. Looking through images in playback is generally pretty quick and responsive, as is generally using the phone. Battery life is quoted as lasting for two days. This is based on “normal” use, so if you are a heavy camera user, or are often using functionality such as 4K video recording you may expect the battery not to last quite so long - during my testing I was happily able to use the phone all day without too much bother though.